First and MOST IMPORTANT, make sure this is a secure location so you guns are safe and locked up away from anyone that should not have access to them. Know the wall sizes you want to put the racks on and think about how much of that wall you want to cover with the wall panels. A rough number of guns you want to hang will also help a lot with know exactly what you need. Think about how you want the guns stored, Vertical, Horizontal, a mixture of both. Think about anything else you’d like to hang on the racks. For examples vests, belts, magazines, gun parts, optics etc………. Keep in mind anything else you envision for your wall or room such as workbench or table, cabinets, ammo storage, etc. PLEASE REMEMBER, GALLOW products are completely modular. The hangers can be moved around, taken off or added on as often as needed. This can be done to make room for more guns or just for a new look. The featured hole pattern in the panels will NEVER be changed so once they are installed, all our current and future hangers will always fit. We offer 2 types of wall panels, Standard and Thin. In both series we offer multiple sizes to help fits most applications. The Standard panels (WP) can be used to create any size rack but commonly used to create larger racks that will cover more space. They require a support bar (SB) part to be installed correctly. These panels can be combined to create a wall panel as large as required. They interlink with together to create a strong, modular rack. When the WP-24.36 and WP-24.23 are installed next to each other, the hole pattern in the panels will continue on spaced perfectly to create one large rack. The WP-24.41 can be installed on top of each other and the pattern will still be aligned. But if you install them next to each other or next to other wall panels (WP-24.23, WP-24.36) there will be about 1 ½” space in the hole panels spacing. The panels will still work great but this may affect using vertical hangers that go from one panel to the next. The WP-48.5 is meant for more of a stand-alone rack for smaller, odd-shaped areas. The Thin panels (WPT) are designed for smaller sized racks. They are thinner and only stick out from the wall less than 3/8”. These models do not us Support Bars but they also hold less weight. These are, most of the times used in smaller areas that require vertical storage for efficiently. They are also used for displays and safe interiors. They can be mounted next to each other to create a larger rack. All the hangers can be used on these panels. We offer multiple sizes with several more being released later this year. 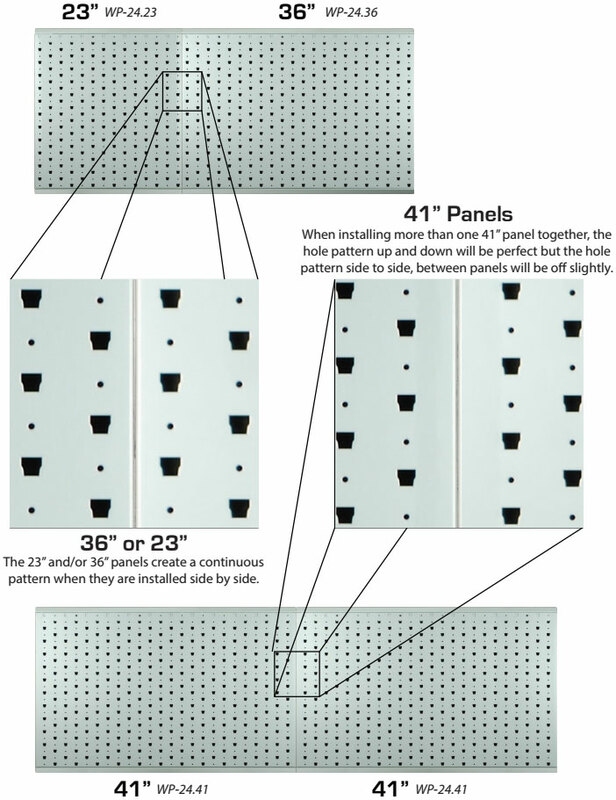 The image below demonstrates the break in pattern by installing two 41" panels side by side. Installing a 41" panel next to a 23" or 36" will also break the pattern. A Support Bar (SB products) is needed only on the top of each row of panels. They are NOT needed further down the rack. The SB’s feature a row of holes spaced at about ½” apart. This helps you align them to make you can screw into the 2x4 (or other wall supports). This part will also help keep the rack level. We offer them in sizes to match each wall panels as well as 72” wide piece. We offer Trim kits (TK parts) to install over the mounting holes for a cleaner look. Our standard colors are Gray and Tan. Both colors were designed so the rack blends into the background and the guns stick out. The Gray is more of a darker Gray and will look a little more “armory-style or industrial”. The Tan is also darker and will be a little more of a “warm” color. Both colors looks great around cabinets, vault doors and trimmed out with wood.